Moissanite is the name given to naturally occurring silicon carbide, it was discovered by Henri Moissan while examining rock samples from a meteor crater located in Canyon Diablo Arizona, in 1983. This fascinating new stone was named “moisanite” in his honor. Natural moissanites are very rare. Moissan ( founder of moissanite ) had only discovered small particles of the moissanite mineral and only in very small varieties since then. Their incredible links to meteorites and pre solar grains makes them truly out of this world gemstone. Lab created moissanites are made to be similar to diamonds. 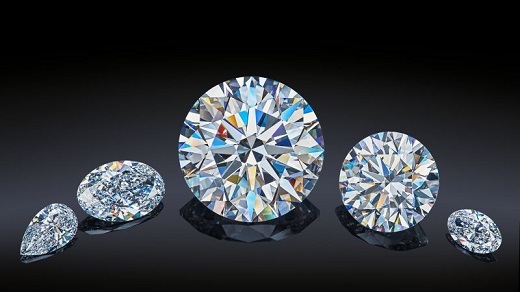 The hardness, optical and thermal properties of moissanite made it a worthy competitor for diamonds. Its brilliance and optical similarity to diamonds is the reason why it has become a popular choice for engagement ring. 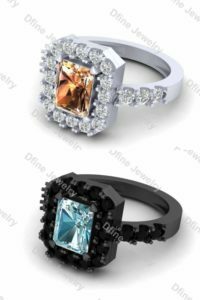 They are affordable diamond alternatives. They are 90% less expensive than a conflict free diamond and 70% less than a lab created diamond. Yet the characteristics are nearly the same. They are not graded on color. Smaller moissanites can look colorless, but larger one will have a yellow or greenish hue depending on exact size and lighting. Many people thoughts it is a diamond…. No it is not a diamond but it can be used as an alternative of diamond. As many people has misconceptions about moissanite and diamond, some also have the same between moissanite and CZ. Moissanite is way way better than CZ. Fake!!!!! How it could be a fake? It is made by human in a particular laboratory and it has its own existent. It has Mohs scale of 9.25 which is 2nd highest after diamond, it has refractive index of 2.65 which considered to be a very good, and in many aspects it scores high. So definitely it is not a low quality gem. Here you can see the company Fire & Brilliance has to say about the moissanite. It is created in the labs from silicon carbide. To make it, temperature should be above 2000 f and pressure exceeded 7,25,000 pounds per square inch and brought to the surface through violent geological activity. It is second hardest gemstone just behind diamond and it has Mohs scale of 9.25. It is harder than sapphire, ruby and emerald. Diamonds are easily one of the hardest natural substances on the planet. On the Mohs scale of hardness it ranks supreme at 10. For the same size of diamond, moissanites are dramatically lower in pricing. This gem vary in price only based on size whether the stone is premium or super premium. Natural diamonds are very expensive and it varies based on shape, carat, cut, color and clarity. Lab created diamonds are more affordable than natural diamonds. High refractive index of 2.65 leading to distinct rainbow effect. Faceting pattern causes higher brilliance. Diamond has a refractive index of 2.42. Sparkle due to brilliance, dispersion and scintillation. Since moissanites are created in labs the ethical and environmental issues related to moissanite are almost nonexistence. While you are concern about ethics diamond is very poor in this aspect. It is estimated that for every carat of diamond mined, over 1 ton of earth is taken out. Moissanites are not colorless and resemble the K grade on the GIA diamond scale. When under certain lights yellow and green tints can be seen in moissanite. 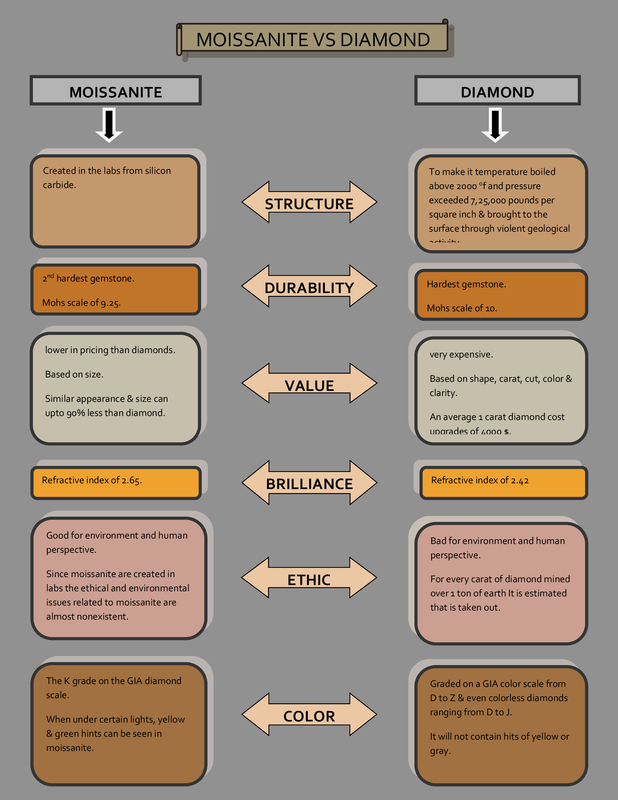 Diamonds are graded on a GIA color scale from D to Z and even colorless diamonds ranging from D to J. It will not contain hints of yellow or grey, that’s why it sparkle white and bright. There is a new trend in the market of fine jewels, one that is changing an industry, and the trend is all about moissanite. An engagement ring is not something that you buy often, and once you do you get to learn things like refractive index, rate of fire and brilliance. Somewhere in between your research on what to buy, you end up discovering moissanite. Can you believe when when I say moissanite is overall better looking even than diamond, it is every bit as durable and multiple time cheaper. Yes its introduction in mid-nineties, this trend had a hard time catching up. But when days passes and information started flowing, today it has been sold tens of thousands of jewelry per month. You can see the graph of trending moissanite engagement ring, it is growing rapidly year by year. How to select moissanite for engagement ring ? Generally there are three kind of quality, you have to choose one out of them for engagement ring or wedding ring. This would be consider the least expensive of all the moissanite options. The forever classic color is linked to a GIA certifies K color which is at the top of the faint range. The most positive factor of the forever classic is that they have a huge selection of stone shapes and sizes. 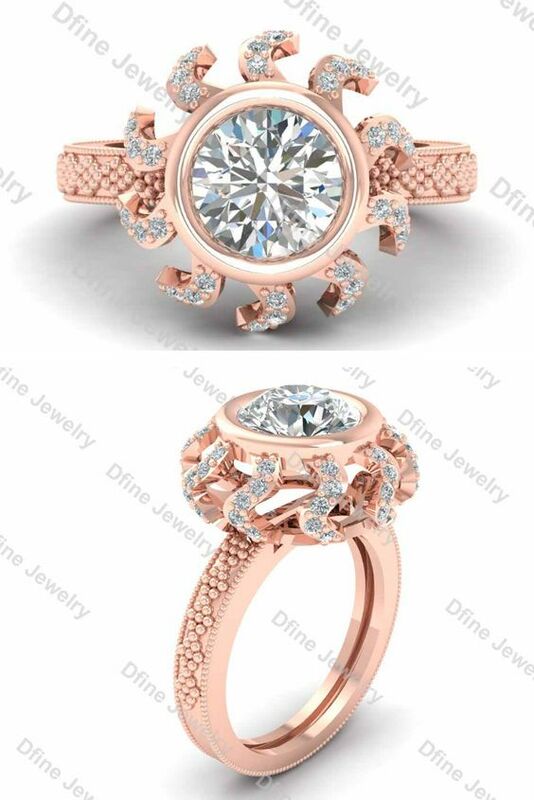 This is considered the middle option of the moissanite and we love to work with at Dfine Jewelry Store. The forever brilliant is linked to a GIA certified H color. In terms of color the brilliant will not have a yellow undertone like the classic. It is much whiter looking. The forever brilliant has less size or shape options than the classic. This is the highest classification of moissanite and most expensive as well. Forever one are compared to a GIA certified colorless diamond at D – E color and have super white look to them. The forever one moissanite is much more rare and they only produce a small amount at a time in very limited millimeter sizes and shapes. If you like diamonds that appear completely colorless this is going to be your best bet. So according to your budget you can choose one of the option. Which is the best place to buy moissanite ? Charles and Colvard was the first company to receive patents to create and market lab made moissanite. Today the company sells forever one and forever classic moissanite. Other than Charles and Colvard, Brilliant Earth and Moissaniteco are also very well known for its moissanite quality. Both diamond and moissanite has their pros and cons, but at the end you have to decide which one is suitable for you. Moissanite has not its own rich history but showing to its growth in fashion i can strongly say it has a bright future. Very well crafted for wedding. This ring contains champagne and aquamarine moissanite with 14k solid gold. The Average weight of the ring is 5 gm. Carat weight of the moissanite is approximately 1.70ct and dimension is 7.5×6 mm. This bezel set moissanite engagement ring looks so pretty with rose gold. Average weight of the ring is 6 gm. And this ring will came with the free shipping worldwide. 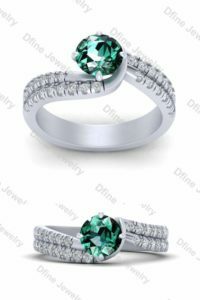 New and fresh teal green color of moissanite makes this ring more fabulous. The average weight of the ring is approximately 4 gm. 925 solid sterling silver metal makes is more affordable. Thanks for reading , if you like this article share it and spread the knowledge of moissanite. Thanks so much for providing individuals with an exceptionally splendid chance to read articles and blog posts from this blog. It is always so brilliant plus stuffed with amusement for me personally and my office peers to search your website at minimum 3 times in one week to read the latest tips you will have. And lastly, I’m also actually impressed considering the astounding guidelines you give. Some 3 facts in this posting are surely the most suitable I have had.